November Sale! ⋆ Sparklewhore.com - Specializing in Niteflirt, PSO, and other adult designs. Throughout November you can take advantage of two great sales and popular services. Banner Special: Save $5 off individual animated banners, only $20 each! Save even more when you order 3 for just $50 each. At a regular price of $25 each, that’s like buying 2 and getting one free! 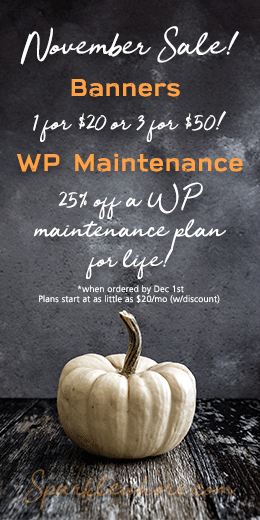 WordPress Maintenance Plans: Save 25% FOR LIFE on anyone WP Maintenance plan when you enroll before December 1st. This is a lifetime discount good for as long as you are enrolled. Most times, plugin and other updates can go pretty smoothly, but compatibility issues, errors, and broken sites are not uncommon. Take the stress our of updating by enrolling in an affordable plan to have all of your WordPress updates handled for you, and the peace of mind of knowing that your site is backed up before updates to ensure your data is never lost. Plans start as low as $20 a month (including discount). Custom plans are available to fit your needs, large or small. Check back December 1st for December’s sale items and special Holiday Freebies! Each month going forward will feature at least one sale item and one freebie set!